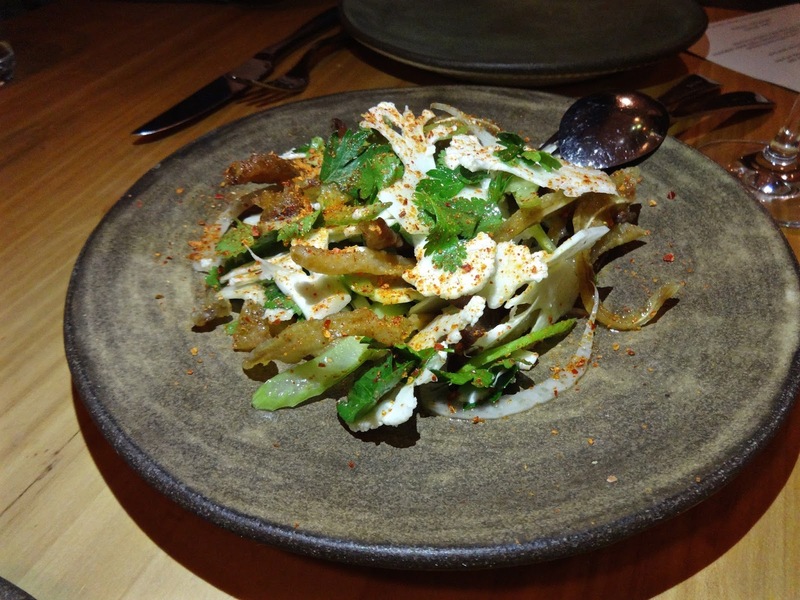 I'll say this right off the bat, I'm one of the few who is not the biggest fan of State Bird Provisions. 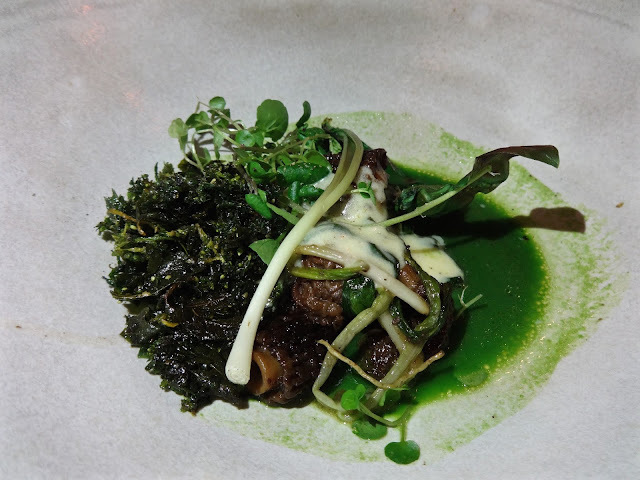 While I liked the concept and a couple of the dishes, most were just so-so and when you factor in the price you are paying with portion and quality you are getting, it was mostly a miss for me. I'm not going so far as to say overrated, I do feel they get more press than is warranted, but that's just my opinion. Even with this cynicism I was still interested when they decided to open another restaurant just a few doors down from the Bird called The Progress. It supposed to be a different concept from the other place, though they were still pushing on the local, organic, what they bought at the farmer's market that day ideal. 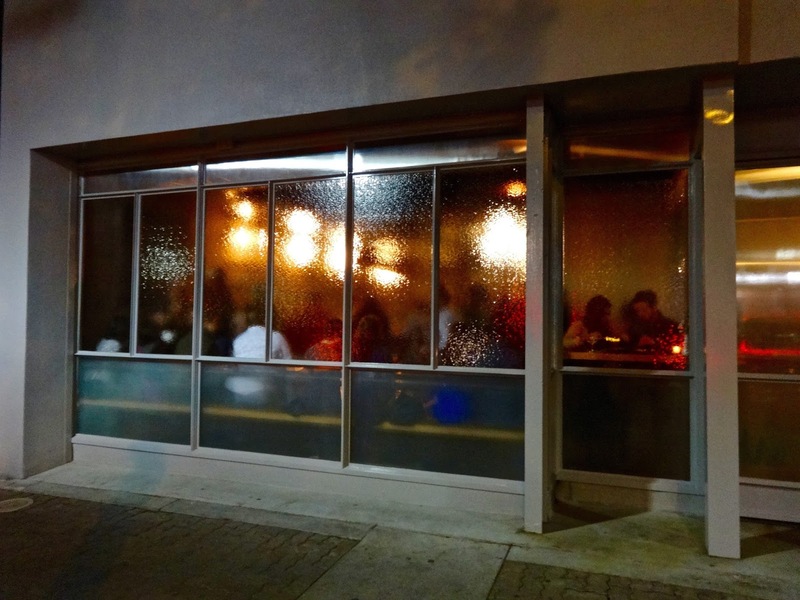 The place has been popular since it opened so getting a reservation was a challenge and I wanted to wait a bit till any kinks got ironed out before we gave it a shot. That opportunity came recently--at 9pm on a Saturday night--it was the only time available. So me and the SO hitched up the big boy pants and headed out to see what all the fuss was about. This is their unassuming exterior--no sign or anything to tell you this is the place--almost as if you have to be "in the know" to figure out what and where this is. Pretentious and annoying--a little--but as I always say, I'm here for the food and thus reserving my judginess. When we get there the place is PACKED and it's very loud. Fortunately we get a table at one of their upstairs areas where the noise is more background and you can actually hear your conversation and the music emanating from the speakers. It's a prix fixe menu where you choose 6 dishes from a set menu for $65 per person (they call it a choose your own adventure family-style menu). That puts it somewhere in the mid-range of prix fixe menus in town--I'm not put off by it. Plates at the top of menu are considered apps and ones on bottom half are meatier mains. After some back and forth with the SO and our server we finally settle on our choices. Shaved cauliflower, herbs and pig fries. Pig fries are basically fat back/pork belly/salt pork--whatever you want to call it--fried into thin crispy strips. There's also fennel, celery, herbs, red pepper oil and flakes. It's a very crunchy dish that I just couldn't get into. I know, surprising, being from the South and raised on fried fatback, I thought I'd like it more. I think I was just thrown by one of the herb flavors that just wasn't mixing well for me with the salt pork. I liked the spicy kick and the crunch of the cauliflower but all together I just couldn't make my taste buds like it. As a counter point, the SO really liked it a lot, also a surprise as they thought they would be into the pig fries part of it. Go figure. I'll probably also blame the fennel, something I'm not a fan of either. Interesting concept and props for pork. I wouldn't order again though I'm pretty sure this has become one of their more popular dishes. 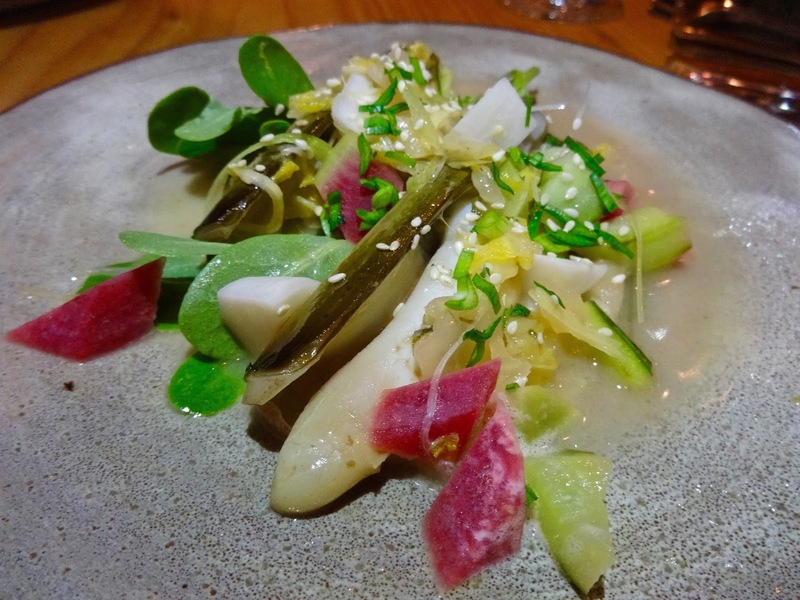 Razor clams on the plancha with kimchi piccata, cucumber, watermelon radish and other crunchy veggies. 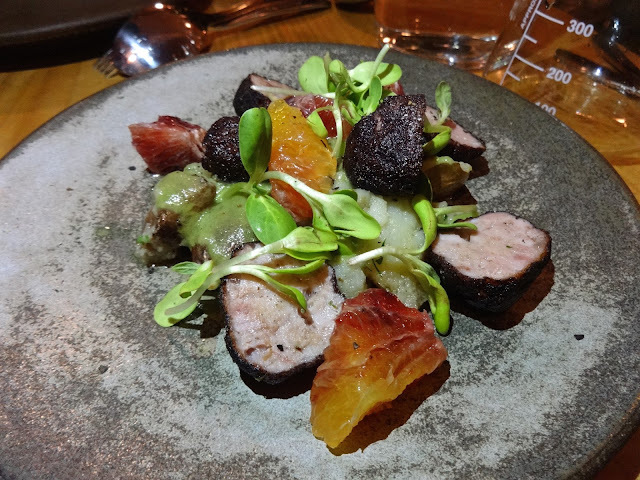 Here's a switch--I liked this dish and the SO did not. Another flavor turn around for both of us. The clams were grilled and tender, plopping right out of the shell. The sauce was like a light slightly garlicky Asian influenced thing that reminded me of stir-frys my mother used to do when I was a kid. It was a flavor profile I enjoyed. Combined with crisp fresh veggies this was my second favorite dish of the night. The kimchi was also a great tangy addition that didn't overwhelm the slight sweetness of the clams. A funky combo that came together well for me. Wood oven roasted morels, smoked hollandaise, fried nettles, ramp juice and pea shoots. It's a mouthful and looks really green and healthy. It was also the favorite dish for both the SO and I. Large earthy shrooms with a great smoky flavor infused through out. A salty tasty crunch from the nettles. The rich creaminess of the hollandaise and some tang from the ramp juice to offset the richness. This had flavor, texture and visual appeal. I could have had (a slightly larger portion of this) dish as a my main meal and been totally happy with it. This would be the one dish I'd say you should get if it is on the menu. 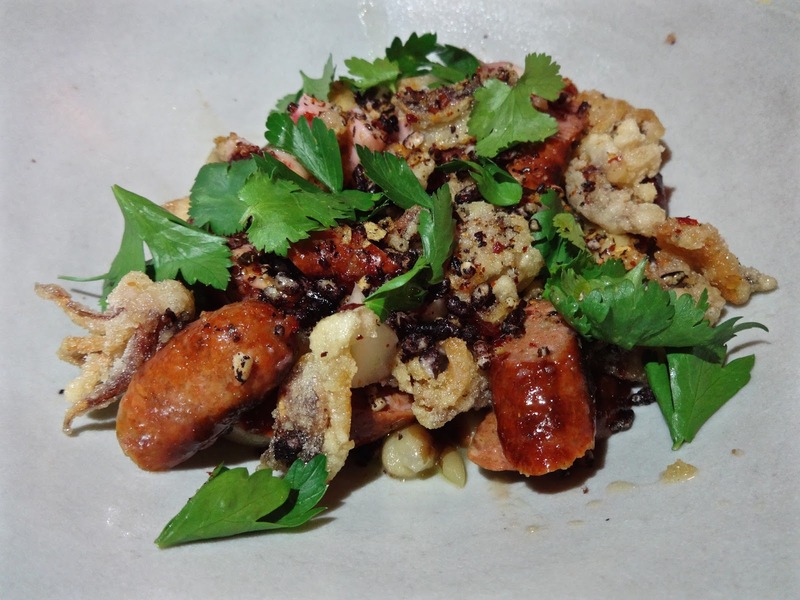 here we have lamb merguez with yellow eye beans, grilled octopus and crispy squid. And this is exactly what you think it is--sausage and calamari with beans. Another unusual pairing where we both like the pieces by themselves, but together, not so much. Yes, an interesting contrast of flavors and textures (again another theme) but ones that don't necessarily need to be paired with each other. And again here, beyond what the basic ingredients taste like, we didn't get much more of a flavor profile. I don't know, maybe I was expecting some exciting spice combo, or maybe I was just over thinking/hoping for more of something that would make me go wow, that was tasty and interesting. Kind of like the smoke in the morels. Instead it was just, that's nice. But we weren't done yet. 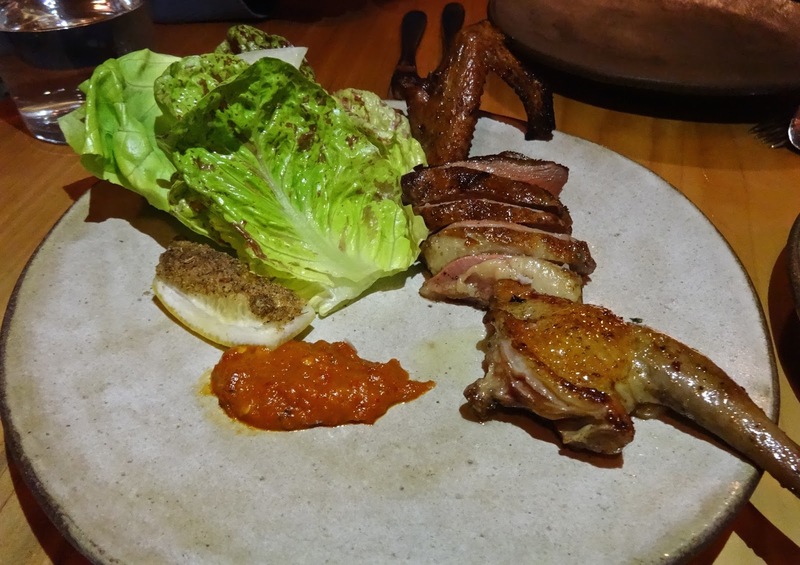 Aromatic spiced squab with salted chili paste. Tasted a little bit like duck and the sliced pieces were nice and juicy. The paste was definitely a kick. For us it was fine, for some folks it may be too hot and it could over ride and flavor you get from the squab. The legs and wings were a little tougher to eat and it would have been nice if the skin was crispier. As is, this was an okay dish and at least it had some added flavor in the paste, though not sure this is something I'd get again. I had hoped they would have some funky dessert concoction going--but it's an additional $10 for a dessert plus this particular nights choices were a sesame almond tort with kumquats, salted caramel island with coconut (that's flan--ugh) and dates a la mode. Yeah, none of those are on my actual sweets of choice list. Thus ending the night on a dessert up note was not gonna happen. What can I say, The Progress is a little like State Bird in that dishes are hit or miss so choosing which ones to get can be a crap shoot. I can see their goal here is to experiment with the fresh and local and pair up ingredients that go that wouldn't normally go together to create didn't flavor and texture combos. Problem with that is, not everything is going to be a winner each time. Still, the upside is that if you are into food experimentation and are willing to give new things a try, then The Progress is probably worth a visit. I mean it is the see and be seen place to be these days, particularly since they keep winning those James Beard Award things. And surely all those critics can't be wrong, right? Or maybe they just know something we don't. What that is I couldn't tell you, but anything is worth a try once.